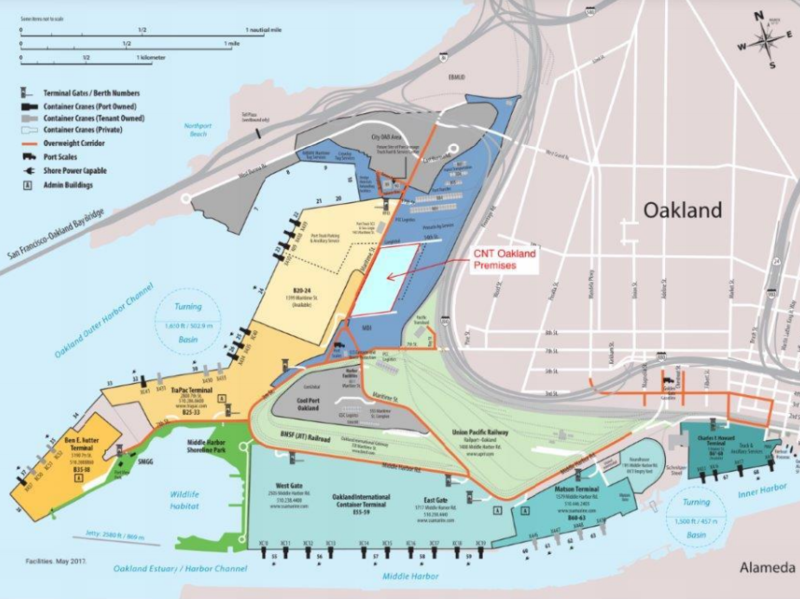 The Port of Oakland's board of directors are expected to vote next month on a deal with CenterPoint Properties to build a massive 440,800-square-foot warehouse on the former Army Base. The warehouse will be a state-of-the-art logistics center connected to the port's maritime facilities, funneling cargo from ships to truck transportation networks. It's expected to generate hundreds of operations jobs. And according to the port and a coalition of nonprofit and labor groups, those jobs will pay living wages. Priority will be made to hire local residents of the East Bay's flatlands neighborhoods that have been historically most affected by the port's environmental problems and deindustrialization of the waterfront. Furthermore, CenterPoint is reportedly agreeing to a so-called ban-the-box policy that will ensure many of the positions at the warehouse are available to people with criminal records, ensuring formerly incarcerated community members can gain access to employment and benefit from the port's expansion. Community groups are hailing the deal — which was negotiated over the past 18 months — as an example of win-win economic development that advances the port, the company, and the community. "This is a system that will benefit the people of Oakland," said Sabir Lockett, an Oakland residents who was incarcerated for 22 years but now is an advocate for providing second chances for employment. Lockett said many formerly incarcerated people face discrimination when they search for jobs, and that they're often locked out of the market, making it difficult to survive. "This is about building trust in formerly incarcerated people as well as providing living wage and local hire so people can stay in Oakland," said Lockett. "It will help to integrate formerly incarnated people back into society." Port spokesperson Mike Zampa declined to comment because the port's board has yet to finalize the deal. CenterPoint Properties also declined to comment. But in the port commissioners' agenda packet for their next meeting some of the basic parts of the jobs deal are confirmed. The Revive Oakland coalition, a group of over 30 nonprofits and labor unions that negotiated with CenterPoint and the port over the jobs deal, also shared some details of the agreement in a press release yesterday. According to the coalition, workers at the new facility, including subcontractors, will be paid, at minimum, a "living wage" of $13.32 per hour with benefits, or $15.31 without benefits. Half of the jobs will be set aside for local area residents, with a hiring priority for people from Oakland's flatlands zip codes closest to the port. And the group said the ban-the-box policy is "one of the strongest" yet negotiated on any project in the nation because it substantially limits the types of criminal convictions records that can disqualify someone from a job and provides greater transparency for job applicants and the employer as to what might be a disqualifying record. The deal also limits the amount of work that can be carried about by part-time employees. Jahmese Myres, director of Revive Oakland, said the deal is important because it's a model for fair economic development in an era when technology is transforming work. Increasingly, the economy is becoming organized around online retail that operates through logistics systems made up of warehouses fed by shipping, rail, and truck transportation. So far, warehouse jobs fulfilling Amazon orders or moving goods to big box stores with automated checkout, have been relatively low-paying and precarious. And these jobs have also been difficult to obtain for people who have criminal records. What: A 66-year ground lease of port land to CenterPoint Properties for construction of a 440,800 square foot warehouse. Cost: CenterPoint will lease the land for $1.3 million per year rising to $6.4 million in year 66.
Who: CenterPoint is owned by the California Public Employees Retirement System, the state's largest public employee pension. Where: On 27 acres of the former Oakland Army Base land that was handed over to the Port of Oakland for redevelopment. Correction: the original version of this story stated that wages at the warehouse will start at $14.44 per hour. The correct beginning wage level under the agreement is $13.32 per hour with benefits. This story was also updated after the Port of Oakland moved consideration of the agreement from a September 28 board meeting to October 12.